Contactez-nous pour connaître le prix de vos jumelles Vixen en précisant les modèles qui vous intéressent. Les Vixen New Foresta sont des jumelles d'ornithologie et de chasse de très bon niveau, à prismes en toit. Corps en aluminium léger, étanchéité à l'azote, traitement intégral des surfaces, prismes BaK4 à enduction diélectrique, design moderne, recouvrement de caoutchouc, grand dégagement oculaire pour porteurs de lunettes. Les Vixen New Foresta sont garanties 5 ans. We don’t doubt that the New Foresta series produced by the Japanese company Vixen is quite well done. In our tests we managed to take a closer look at the 8x32 and 8x42 models and both performed very well also featuring a very good price/quality ratio. The introduction of more expensive reflection layers which, joined with good quality anti-reflection coatings, enabled the transmission of the Vixen to exceed the level of 90% in the middle of the visible spectrum. What’s more, in the red part of the visible spectrum it reaches 92% and in the blue it is not much lower than 90%. This even performance has another serious advantage – very good colour rendition. There are more good points in store. 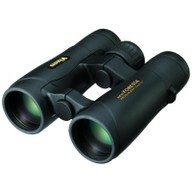 The tested pair of binoculars is well-made and corrects most of optical aberrations quite well for its price segment. Its weight and dimensions are sensible, but not due to the reduction of the prisms’ size; it helped keep the exit pupils only slightly egg-shaped and the brightness loss at the edge of the field – insignificant.